occasionally --- especially after a new release. I do a lot of web page development in which a lot of photos and other image files are processed (renamed, cropped if need be, down-sized, gamma-corrected if need be, thumbnailed, etc.). Since I could not find a program on Linux that would do all the things I needed to do with directories of image files (such as batch thumbnail making, which I could do with the free 'Irfanview' program on MS Windows), I looked into writing scripts using a couple of ImageMagick commands --- to accomplish those tasks, and even more. After developing a set of about 20 ImageProcessing scripts, I found that there were at least 10 other categories of scripts that I wanted to develop --- and I found that I could put them in separate directories of my Nautilus scripts directory --- which is the '.gnome2/nautilus-scripts' directory of one's home directory (for Gnome2, Gnome releases circa 2009 and before). For Gnome3, some web pages indicate that the location is the '.local/share/nautilus/scripts' directory of one's home directory. The location for the MATE-Caja system is indicated below. To see the details of that script-development story (along with images of the code of many of the Nautilus scripts), see the FE Nautilus Scripts Description page. More 'FE Nautilus Scripts', in more categories (sub-directories), may be added in the future . as seen in this image of the Nautilus 'right-click-on-file(s)' popup menu. 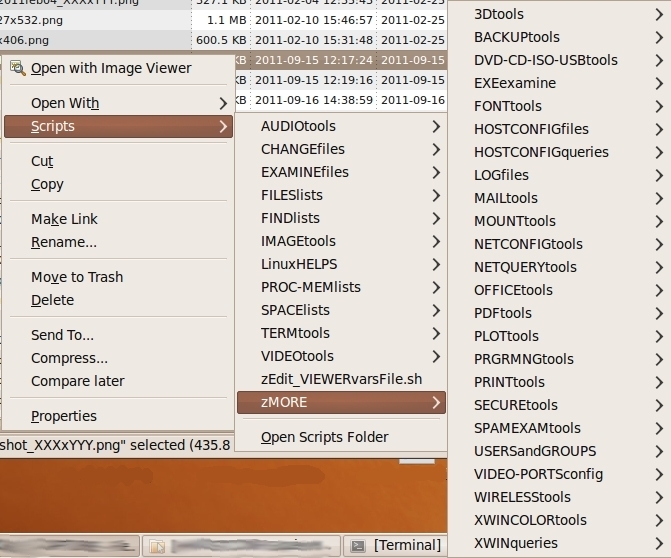 The 'zMORE' menu item provides a popout to about 17 additional FE Nautilus Script groups (sub-directories), as seen in this zMORE menu image. Additionally, I have put a 'TEST' sub-directory (sub-menu) in some of the 'FE Nautilus Script groups' --- to hold scripts that I need to test (more). Since the code is 95% to 100% in place for those scripts to work in a useful fashion, I go ahead and provide those scripts (mainly for me to try them out, on some of my other computers, such as netbooks, when I am on the road). If the 'TEST' scripts don't work quite right for you, you can simply edit them --- like you can with ANY of the 'FE Nautilus Scripts'. As I have mentioned in the 'FE Nautilus Scripts' description pages, if I am going to apply a 'multi-file-input' script to a large number of files, say 40, I first apply it to a few, say 3 --- to see if the script is functioning and doing what I want. If the script goes OK on the first 3 files, then I apply the script to the other 37 files. I suggest that you use that cautious procedure when performing 'batch' file script applications. May the shell script force be with you. --- that I use to put underscores in place of spaces, in filenames that contain spaces. while test ! -z "$1"
for-loop technique that I used in most other 'multiple-filenames-input' scripts. The latter technique fails on files whose names have embedded spaces. The 'positional parameters' that we are concerned with is the filenames selected by the user, using the Nautilus file-manager. The 'SPACE2underscore' 'CHANGEfiles' script has handled any problems that I have had with filenames containing spaces. Hence, until mid-2011 (when I discovered the 'minimalist-for-loop' technique), I did not update the 'FE Nautilus Scripts' (the scripts that have multiple-filenames-input) to eliminate the 'for FILENAME in $FILENAMES' technique --- which fails when encountering a filename containing spaces. However, in July 2011, I swept through the FE Nautilus Scripts to replace the 'for FILENAME in $FILENAMES' technique with the 'for-loop-without-in' technique in the various 'multi-filenames-input' scripts. That should fix the spaces-in-filenames 'handling deficiency' in the pre-July2011 'FE Nautilus Scripts' code. The 'FE Nautilus Scripts' system is by no means finished. I keep finding utilities that I need, that can be nicely implemented in a Nautilus script. For example, there are still more 'IMAGEtools' that I will add, using the ImageMagick 'convert' command. In particular, I will probably add more utilities that transform or add colors to image files --- with or without embossing, or other decorative (image-enhancing) touches. In the 'FINDfiles' category, I find that when I apply some of those 'recursive' utilities on a huge directory structure, it may be almost a half-minute or more before the results list pops up. I would like to be assured, throughout the run, that the script is running. I will probably change those scripts to run the 'find' command in an 'xterm' that pops up at the start of the search. The 'xterm' window will provide a kind of progress bar, showing the names of files being searched. This 'progress window' will be better than a 'progress bar' that shows filenames being searched, because this 'progress window' will show about 40 filenames at a time, rather than just one at a time. And, by grabbing the terminal scroll bar with your mouse, you may be able to freeze the listing of files and scroll back a few hundred filenames to review some of the files being processed. In the 'EXAMINEfiles' category, I may promote a few scripts out of the 'TEST' sub-directory. In particular, I want to test a script that compares two directories --- '02_show_DIFF_of2dirs.sh' and/or '02_show_SDIFF_of2dirs.sh' --- because, for example, it will be handy when I want to compare the files in two releases of one of my sub-systems ('FE xpg' or 'FE AppMenus'), by selecting the two release directories, in Nautilus, and then right-clicking and going to the 'EXAMINEfiles' group to initiate the comparison. In the 'zMORE' categories, I will be adding 3D file conversion utilities to the '3Dtools' group --- and I will be adding 'gnuplot' utilities to the 'PLOTtools' group. And I will be adding various DVD, CD, and USB tools. Furthermore, in any FE Nautilus Scripts added in the future, I plan to use the 'for-without-in' technique (and other techniques) --- to handle filenames that contain spaces --- even though I usually avoid such filenames myself, by using underscores rather than spaces. So you see that there are plenty more additions and enhancements coming in the 'FE Nautilus Scripts' system. In fact, it will probably be the case that I will be adding utilities to that system until I die. This FE system may never reach a 'plateau'. So check back here every few months. After about 2 years of using these scripts and going through 'gyrations' in naming them, I have settled on a naming convention that eliminates most of those gyrations. The new naming convention is described in detail on a separate NAMING CONVENTION web page. In the past, I was ending up with script names in which there was a 'mash-up' of parts 2 and 3. And part4 was often missing, and I found that I was quite often perplexed without part4. This naming convention has taken most of the 'gyrations' out of the script naming. One of my main conundrums now is which characters to make upper-case and which to make lower-case. Conundrums like this are relatively minor. Here is a link to a list that is a 'snapshot' listing of the 450-plus (!) 'feNautilusScripts' script names that existed in early 2012.
the 'zMORE' menu pop-out with its 15-plus added categories. See many examples of the 4-part script names on the 'feNautilusScripts' NAMING CONVENTION web page, where the script-naming --- especially 'part2' --- is described in more detail. Note that you have the FREEDOM to rename any of the scripts as you see fit. The install file is a self-extracting shell script. It would be nice if we could simply name it with a '.sh' suffix. But it appears that most web browsers (or, actually, web servers) will assume that it is an all-text file, when, in fact, it has a gzipped tar file appended to the script portion. When the web browser asks for the file from the web server, if the file has the '.sh' suffix, the file will be downloaded in 'ascii' mode instead of 'binary' mode. The binary data in the file (the gzipped tar stuff) gets corrupted. As a workaround, the '.sh' file is provided with a suffix of '.sh.exe' --- in hopes that the web-server/web-browser combo will think the file is a 'binary' file and download it in a 'binary' mode that does not corrupt the file. For good measure (that is, as an alternative), the install file is also provided with the suffix '.sh.tar'. So if the '.sh.exe' file does not work for you (say, the web-server/web-browser 'dance' tries to do something 'funny' with files with a '.exe' suffix), right click here, on the '.sh.tar' file, and, in the popup menu of your web browser, choose to save this self-extracting shell script in a download directory on your machine. To see the quick version of installing the 'FE Nautilus Scripts', go to the brief SUMMARY section at the bottom of this web page. To see a movie on how to install 'FE Nautilus Scripts', click here (or right-click and save the movie file to local storage). OR, go to the FE Videos page to see the install videos for the several FE subsystems. The install procedure for each subsystem is similar --- prepare and run a self-extracting script, in 3 quick steps. NOTE: The '2017sep10' release of the 'FE Nautilus Scripts' is a fairly mature release --- corresponding to a '0.9', say, release of systems using that kind of release numbering system. In fact, most of the scripts are suitable for 1.0 release. In the sense that the utilities that I will be using the MOST in future releases have probably already been implemented, it is correct to say the '2017sep10' release corresponds to a '0.9' release --- or even 1.0. In fact, I find myself using scripts in the 'IMAGEtools', 'TERMtools', 'FILESlists', 'CHANGEfiles', 'EXAMINEfiles', 'FINDfiles', and 'LinuxHELPS' groups on an almost daily basis. The 'FE Nautilus Scripts' have not had the benefit of feedback from lots of users. Hence, it would not be appropriate to call the '2017sep10' release a '1.0' release. Many of the 'FE Nautilus Scripts' need a text viewer program to view a text output file. The 'FE Nautilus Scripts' installation includes a common 'include script' to set a TXTVIEWER variable, that is used in any of the FE Nautilus Scripts that need that variable --- that is, in any of the scripts that need the text file viewing function. 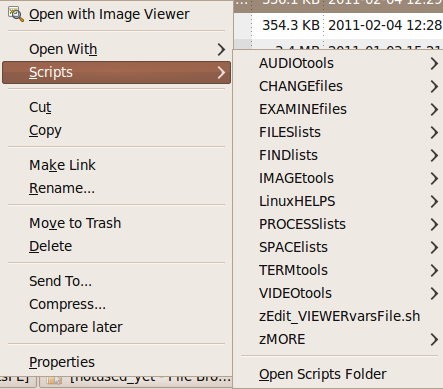 After the install, you should see a file named 'zEdit_VIEWERvars.sh' near the bottom of the 'Scripts >' menu of Nautilus. At any time in the future, you can click on that edit script to edit a common 'include script' file --- named '.set_VIEWERvars.shi'. NOTE: The dot prefix makes the '.shi' file a 'hidden' file --- assuring that it will not show in the Nautilus 'Scripts' menu. It is a partial script that does not provide any useful function if you attempt to run it by itself. The suffix '.shi' stands for 'shell include'. The user can choose the text viewer he/she wants to use by editing that one '.shi' 'include' file that contains some simple lines of shell script code --- rather than editing about 400-plus scripts in the 25-plus 'FE Nautilus Scripts' sub-directories. De-comment the 'TXTVIEWER=' statement that you want to use, and comment the others. Of course, the user can edit any of the 'FE Nautilus Scripts' and tailor the text viewing utility to be different from TXTVIEWER, for that particular script. In other words, you can over-ride TXTVIEWER in any script. You will see several other viewer/editor variables that you can set in that '.shi' 'shell script include file'. Examples: TXTEDITOR, HTMLVIEWER, IMGVIEWER, IMGEDITOR, ANIGIFVIEWER. These variables are used in various FE Nautilus Scripts --- sometimes along with the TXTVIEWER variable or with some other viewer/editor variable. For example, some HTML-generating scripts use both HTMLVIEWER and TXTEDITOR. Scan the 'viewer/editor' variables to see which ones you want to change. Of course, you could navigate to the '$HOME/.gnome2/nautilus-scripts' directory at any time and edit the '.set_VIEWERvars.shi' file. The 'zEdit' script is not really necessary. But having the 'zEdit' option show in the Nautilus 'Scripts >' list is a reminder and a convenience --- to make it quite fast and easy to make a different viewer/editor program the default. To keep an organized directory structure, you may find it better to make a directory named 'DOWNLOADS', for example, in your Home directory. Then save ALL your 'third party' application install files there, from then on. By 'third party', I mean applications that are not distributed via a monolithic package management system of your Linux/Unix system --- like the FE apps are not. Seamonkey2 (a Mozilla.org web browser, son of Netscape) is another example of such an app. In mid-2010, it was not available in the 'Ubuntu Software Center' nor in the 'Synaptic Package Manager'. I downloaded the Seamonkey2 Linux install file from the Seamonkey website into my $HOME/DOWNLOADS directory --- and I installed it into a $HOME/apps directory that I created for apps that I want to preserve during Linux upgrades. I preserve the apps simply by not overlaying my home directory (and by backing up my home directory as a precaution). Similarly, the FE subsystem self-extracting install scripts can be put in $HOME/DOWNLOADS and installed in $HOME/apps. So the install scripts can be kept in $HOME/DOWNLOADS and the install files are in $HOME/apps --- with a few FE 'config' files in $HOME/.freedomenv, as indicated below. So all files of the FE subsystems are in your home directory. The files get backed up if you backup your home directory. Furthermore, the files are preserved (not wiped out) if you preserve your home directory when you update your operating system. Again, to see the quick version of installing the 'FE Nautilus Scripts', go to the brief SUMMARY section at the bottom of this web page. A longer, more detailed version of the installation instructions is in the following paragraphs. First, rename the install file --- remove the '.exe' or '.tar' suffix. If you are positioned at your download directory with the Nautilus file manager, simply right click on the install file, choose 'Rename' in the popup menu, and use the Backspace or Delete key to remove the last 4 characters from the filename. When you download the self-extracting script file to your file system, it may lose its execute permissions. [This is a nice security feature, making it harder for people to run rogue programs on your computer.] You can make sure the '.sh' file is executable as follows. Navigate to the downloaded install file in the Nautilus file-manager --- if you're not there already. Right-click on it and choose 'Properties' at the bottom of the Nautilus options window that pops up. Go to the 'Permissions' panel on that 'Properties' window and make sure the checkbox labelled 'Allow executing file as program' is turned on. While you are in a terminal window, positioned at the directory which contains the self-extracting install script, you can examine the script lines of the self-extracting install file by issuing the 'head -250' command against the file. You will see about 230 lines of script text (lots of comment lines) --- and then some gobbledy-gook characters in the terminal window. That gobbledy-gook is the starting contents of the gzipped tar file that contains the 'FE Nautilus Scripts' installation sub-directories and files. The self-extracting script is a combination of text lines and binary data. If you try to view the install script with a text editor, like 'gedit', it will not view the file, because the editor detects the binary data and thinks it is dealing with a binary file. The authors of 'gedit' do not allow you to try to display the file --- partly because 'lines' in (some) binary data files are thousands of bytes long. That is, type a dot and slash, then type (or paste) the filename and press Enter. the 'mkdir' commands that make a '.freedomenv' directory in your home directory --- and a subdirectory named 'feNautilusScripts' under that directory --- if they did not exist already. a 'cp' command that copies a 'set_DIR_NautilusScripts.shi' shell 'include' file to the '$HOME/.freedomenv/feNautilusScripts/' directory --- from a 'hidden' '.set_DIR_NautilusScripts.shi' file in the installation 'nautilus-scripts' directory. If you are positioned at the '.sh' install script (that is in your download directory) with the Nautilus file-manager, you can double-click on the '.sh' file --- after making sure that it has execute permission, as described above --- and choose the option to 'Run in a terminal'. You will see the messages described above appearing in the terminal that pops up. If the terminal window just flashes and does not stay open (or the installation goes so fast that the terminal window does not even flash), navigate to the '$HOME/.gnome2/nautilus-scripts' directory, and see if the 'AUDIOtools' directory and about ten other 'FE Nautilus Scripts' directories were created. Check if the 'AUDIOtools' directory contains some '.sh' script files. If those exist, then the installation probably went OK. I did a test install in which the FE Nautilus Scripts directories were created but the scripts did not seem to be put in the directories, even though the messages from the 'tar zxvf' command indicated that the files, as well as the directories, were being extracted from the tar file. It turned out that the FE Nautilus Scripts *WERE* in the script sub-directories --- such as 'AUDIOtools' and 'FINDlists' --- but they could not be seen with the Nautilus file manager. On the other hand, I could see the scripts were installed by opening a terminal window and issuing a command like 'cd $HOME/.gnome2/nautilus-scripts' and then issuing a command like 'ls -R'. It turned out that I could see the scripts of each sub-directory (in Nautilus) if I clicked on the 'Reload' button (the curled arrow) when in each sub-directory. However, instead of doing that for each sub-directory, it is easier to simply shutdown and then start up your computer and login again. Then you should be able to see the scripts, with Nautilus, in any of the 35-plus FE Nautilus Scripts sub-directories. It seems this failure to show the scripts may occur if you remove (or move) a previous version of the FE Nautilus Scripts from the 'nautilus-scripts' directory (using file operations in Nautilus) and then install the new version. The Nautilus file manager seems to keep a 'cache' of pointers to the previously existing script names, and when you install new scripts in their place, the pointers to the new scripts are not updated. Hence Nautilus does not show the new script filenames in its GUI. There are ways to avoid re-starting the computer to refresh Nautilus, but probably the least confusing and least tedious way to refresh the Nautilus pointers to the 'nautilus-scripts' files is to simply do the computer re-start and login again. Again, before doing the re-start, you could confirm that the scripts were indeed installed by opening a terminal window and issuing a command like 'cd $HOME/.gnome2/nautilus-scripts' and then issuing a command like 'ls -R'. When the self-extracting shell script file executes, it automatically puts a set of sub-directories in the 'hidden' directory '$HOME/.gnome2/nautilus-scripts' in your home directory. Note that you do not have to change to 'root' to do the install. In fact, I never like having to switch to 'root' to do an install. When I have to give the root password to do an install, I am being put in the position of having to trust the people who put the install package together that they are NOT going to use that all powerful permission to do serious damage to the root-owned directories and files on my machine. And I am trusting that they will NOT install key-loggers or Linux/Unix viruses/trojan-horses on my machine, hidden in that massive directory structure. Or 'they' could install a program, hidden among all those directories, that sends an organization (or person) a notice over the Internet, or do some other useless-to-me thing, whenever I unknowingly run their program (and when I have my connection to the Internet turned on). Do you hear that? --- HP, Microsoft, Google, and a large number of other software distributors? Cut the nonsense out! At least prompt us, before taking liberties with our computers. For example, let us decide whether we want your programs to start up as part of our computer's boot up process. Maybe we don't want your 'stuff' shoved in our faces every time we log on --- or every time we start up an app in which your (never-going-to-be-used-by-me) stuff has been included as an intrusive plugin. So rest easy. This install does not require you to open yourself to damage like mangling of your root-owned directories --- nor commandeering of root-owned processes. And nothing is added to your computer's startup processes. YOU are the one who decides when the 'FE Nautilus Scripts' installed components are run. This install does not ask for an install directory. It uses the '.gnome2/nautilus-scripts' sub-directory that you probably have already, in your home directory --- if you are a Gnome2 user. Having apps like this in your home directory can be a real boon at Linux OS upgrade time. If you follow the procedure of preserving your home directory (in a separate disk partition) during a Linux OS upgrade, then you do not have to re-install the FE Nautilus Scripts, after your Linux upgrade. Since these installation files are not in a system directory like '/usr', they will not be wiped out in a Linux system upgrade. And even if you allow the Linux OS upgrade to wipe out your home directory, if you simply drag your 'nautilus-scripts' directory onto a USB stick (or some other storage device) before the Linux upgrade, you can simply drag it back to your home directory after the Linux upgrade is complete. After installation, the 'FE Nautilus scripts' files occupy on the order of 6 Megabytes of space. The self-extracting install script is about 4.5 Megabytes in size. The self-extracting install script extracts the appended, gzipped tar file into install directories that occupy about 6 Megabytes of disk space. This is small compared to applications like GIMP or Firefox. I contend that you can get a lot of bang, for zero bucks, from this set of about 400-plus small shell scripts. The install directories go under the '$HOME/.gnome2/nautilus-scripts' directory --- in a simple, 'flat' directory structure --- only one level of directories. [Well, that was the original intention. But now, there is one more level of subdirectories under 'zMORE' --- a category that I added about a year into 'feNautilusScripts' releases --- to keep the list of 'first-level' categories from being too long. There are about 5 to 20 script files in each subdirectory. You run these Nautilus Scripts in the usual way: You navigate to an appropriate directory and right-click on a file --- or select multiple files, then right-click. In the popup menu that appears, hold your mouse cursor over the line 'Scripts >'. Then you will see the list of 12 'FE Nautilus Script' directory names that are listed above. Slide your cursor over one of those directories. A submenu will open, with the script names showing. Click on the script that you want to run. I have tried to give the scripts meaningful names, that indicate their function and/or their input and/or their output. But you can rename them, if the names don't work for you. In fact, there are numeric prefixes --- like '00_' and '01a_' --- on the script filenames, so that you/I can make the script names appear in the order you/I like, simply by changing the number/prefix --- that is, by simply renaming the script files in the '~/.gnome2/nautilus-scripts' subdirectories. The 'LinuxHELPS' scripts and the 'PROC-MEMlists' scripts are rather unique, because those scripts do not pay any attention to the directory and file that you have clicked on. You can right-click on ANY file in ANY directory (including a directory in a directory) to get to (and execute) the 'LinuxHELPS' scripts, at any time. The scripts in the 'LinuxHELPS' category give you a way of exploring your computer, quickly, to see what utility programs are on your computer --- along with showing 'man' helps for many of the programs, quickly. The 'LinuxHELPS' file-lists and man-helps are shown in a GUI text browser of your choice. When you double-click on the '.sh' file, there is no need for a progress bar. The install occurs in about one second. After the install, remember to use the 'zEdit_VIEWERvars.sh' script, near the bottom of the 'Scripts >' menu of Nautilus, to set the default VIEWERs and EDITORs that you want to use --- as described above. To see a movie on how to install 'FE Nautilus Scripts', click here (or right-click and save the movie file to local storage). OR, go to the FE Videos page to see the install videos for the several FE subsystems. The install procedure for each FE subsystem is similar --- prepare and run a self-extracting script, in 3 short steps. If I install a new release of the 'FE Nautilus Scripts' on one of my non-development computers, here is what I do. You may want to use this technique if you download a new release. It involves moving the old 'FE Nautilus Scripts' directories (rather than deleting them), to make room for the new ones. This provides a backup --- and the old scripts are available for comparison/reference. In the '~/.gnome2/nautilus-scripts' directory, with Nautilus, I make a new subdirectory named something like '.NautilusScriptsFE_OLDyyyymmmdd', where 'yyyymmmdd' (or 'yyyymmm') is a date like the approximate release date of the old release. Then I drag the old 'FE Nautilus Scripts' directories --- AUDIOtools through VIDEOtools, and zMORE and a couple of 'VIEWERvars' files --- into the 'OLD' directory. Note that I used a 'dot' ( . ) on the front of the directory name '.NautilusScriptsFE_OLDyyyymmmdd'. This is so that that directory name does not show up whenever I open the Nautilus 'Scripts >' menu. Then I simply do the installation as described above --- namely, download the '.sh.exe' self-extracting script into a download directory and perform the three simple steps to extract it. For more info on the nature of the 'FE Nautilus Scripts' and how they are organized and used, please see the 'FE Nautilus scripts' Description page. You can browse the comments in any of the scripts to see their purpose and to see any unique considerations on how they can be run. Examine the 'guts' (code) of the scripts. Pick up script writing tips. Or think about the way you would write the scripts, to improve on them. Just in case the latest release of the FE Nautilus Scripts is deficient in some way, here are some of the past releases of the self-extracting-script files. They can be installed using the simple 3-steps described above. Simply right-click and use 'Save Link Target As...' (or the equivalent) to save the self-extracting-script to your downloads directory. FE . . . . Software that Scratches Where It Itches. Page was changed 2018 Aug 11. Page was changed 2019 Mar 26.